MYRISTICA AROMATICUS Tibetan incense cones are traditionally prepared from myristica fragrans and 30 other high-altitude medicinal herbs and roots. This curative and healing herbal incense restores the balance of “wind” in the body and mind. 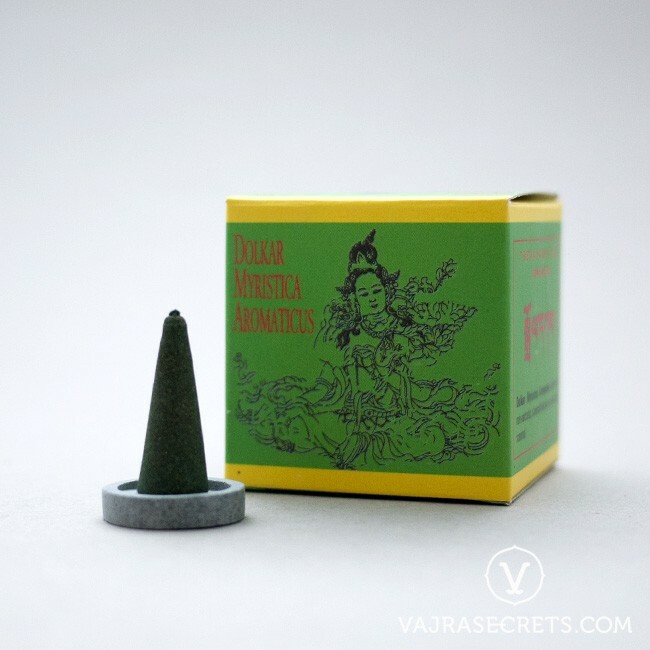 Made according to a Tibetan incense recipe formulated by the late Dr. Lobsang Dolma Khangkar of Tibet, also known as the "Mother of Tibetan Medicine", MYRISTICA AROMATICUS Tibetan incense cones are formulated from myristica fragrans and 30 other high-altitude medicinal herbs and roots. Prepared under the supervision of the illustrious Tibetan doctor, Dr Dolkar, this curative and healing herbal incense restores the balance of “wind” in the body and mind. It should be burnt and inhaled for all disturbances and disorders caused by wind ("Lung") imbalance of the three humors, as classified in the Tibetan medical system, including insomnia, tinnitus, psychosis and other emotional disturbances. These natural incense cones are non-toxic and contain no narcotic or habit-forming ingredients. Environmentally-friendly and completely safe for inhalation. Includes a complimentary ceramic incense cone burner. Light the tip of the incense cone. Gently extinguish the flame by blowing or fanning. The cone should be gently smouldering and releasing delicate wisps of fragrant smoke. Place in/on an incense cone burner with tip facing up. Alternatively, it may be placed in a bowl burner on a bed of natural ash.